Tighten your laces, look to the band, don’t let your knees hit the ground. The music has started, and they can’t leave the floor. There’s no rule book, but as far as they know, the aim is just keep going; that’s what everyone else seems to be doing. A tale of resilience, strength and the need to just stay on your feet, The Letter Room present a sweat-soaked marathon with a northern soul. 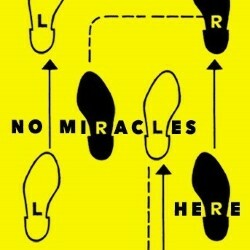 Packed with live music and wall-to-wall dancing, No Miracles Here is an anthem to feeling alive and keeping the faith. Supported by the RSC.